The author Té V. Smith wrote: “No one warns you about the amount of mourning in growth.” I’ve been thinking about growth and mourning lately. It’s the part of growth that we don’t consider much when we say we want to grow up. Like the way we used to dream of being adults as kids and now, on so many days, we long to shed the complexity of our grownup lives and go back to the playground. Recently, while on a family vacation in rural Minnesota, I reflected on letting go and stepping forward, and wrote some thoughts down. I called it, New Shoes. I guess it’s a poem of sorts. Getting new shoes as a child was a traumatic event for me. 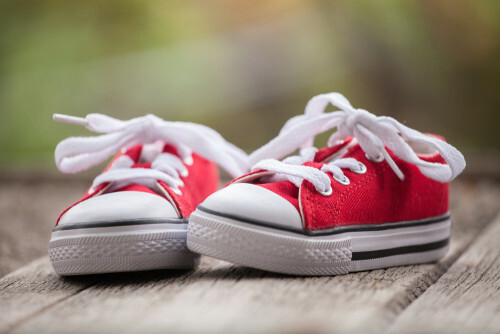 My mom had very little money and I had very big, crazy feet, which seemed intent on wearing through my shoes faster than the feet of other boys did. My poor mom did the best she could to save enough money to keep up with my growing feet, but, inevitably, I’d end up wearing my shoes until I wore holes in the sides. My mom would patch the holes with duct tape and send me back to play in my patchwork shoes until my feet just wouldn’t fit in them any longer. I patched a lot of holes in my life that way — finding interim solutions that never really fixed anything but allowed me to keep going. Two divorces, bad food, good wine, and a life of bells and whistles became my adult version of that duct tape on a lifestyle that, like a pair of old size-thirteens, was wearing thin. We don’t often associate mourning with growth. We know growth can hurt — no pain, no gain — and that breaking through barriers and going places we haven’t gone previously can be scary and painful. But what about all we leave behind: stories, jobs, trophies, friends, old belief systems? The stuff we say we’re not but, in so many ways, actually are. Our lives are a complex web of identifiers, things we point to as proof of our unique existence. As we grow some of that gets lost, making the experience of growth one of moving forward, but also a death of sorts. The closing out of old chapters as we move on to new ones requires we make peace with what we leave behind … and to do that we have to mourn, which can hurt. I think that’s what Té V. Smith meant when he said that no one warns us about this mourning. It just kinda sneaks up on you one day as you’re going along happily growing. Like a painful skit in the Jackass movies, life catches you by surprise and smacks you square in the heart with the realization that a part (or parts) of who you thought you were no longer are. Recently my wife, who’s on a sabbatical from her medical practice, called a company for whom, a few years prior, she had built a complex diagnostic protocol. She identified herself, “Hi this is Dr. Christy!” expecting the usual familial response. Instead the person on the other end of the line paused before replying in a puzzled tone, “Sorry … Dr. Who? What’s this regarding?” I noticed a sadness in Christy that night. I gave her a hug and asked what was wrong. She shared the story with me and then said, “I know it’s silly. But it hurts.” I remember the first time I called Live Nation and was asked by a new secretary to spell my last name. It felt like someone had taken my ego out for a long ride into the Vegas dessert and roughed it up. Like Christy, I felt silly to feel hurt by something so intellectually insignificant. But it hurt nonetheless. All mourning does. In this way, growth provokes mourning, but mourning also provokes growth … the growth of letting go and leaning into life and its lessons. This is why the mourning is important. It’s why we can’t fake our way through life’s lessons with a politician’s grin and a nonchalant “it is what it is.” Life certainly is what it is, but what’s equally true is that it’s not what it’s not. And growth is very often not easy. So we mourn, and through the mourning we learn the lessons life has to share and, perhaps equally important, we learn how to be there for ourselves in times of need. Many of us are going through some kind of growth right now, moments in which life is asking us to let go of an experience, a person, or a dream that we’ve been holding onto tightly. This comes to us in the form of divorces, job changes, foreclosures, diseases, missed targets at work, watching our children grow up, or saying goodbye to loved ones who’ve passed on. This week I invite you to be authentic to those experiences. To admit that letting go is hard. To allow the truth that growth brings mourning and to allow yourself the space to grieve as you grow. I invite you to be there for yourself, just as a good friend might be, to hold your own heart with the tenderest of thoughts as you slowly let go, and to grow … supported by the knowledge that we are all in this together. Hold your heart with the tenderest of thoughts as you slowly let go… and grow. Thank you Jason, your New Shoes analogy and the image of patching old ones with tape, had me examining when I’ve attempted to hold on to the old before breaking free and allowing the new and unfamiliar space within me. This is truly my favorite blog you have done!!! I have learned through my now 50 years of life, that without pain and mourning, we just simply do not grow. It must hurt before we will change and accept. Thats just the way it is. Thank you Jason for putting this topic into such a way to help ease and comfort while going through it! Nailed it ! This gave chills down my body as I look back just these last 5 months of my life and as I stand where I am today this puts it in perspective understanding the growth process I went through in my life.. As I grew into my new sneakers…….I thought I was dying at 37. It was the horrible and Honestly I never thought I would have made it out alive as I was in the moment back then. Today, I stand with peace clarity, and happiness which I was lacking for the last 17 years of my life. This touched home and I will print this and be able to reference back. Thank you. Jason – thank you for this incredibly insightful article. As I read it I asked myself the question, “Have I mourned the changes that are perpetuating my growth?” I couldn’t definitively answer the question…I’m not sure if I have or not. In your estimation, how do you know if you have mourned or not? I’ve been sad, but if anything I believe that the sadness was unproductive because I likely retreated from it instead of opening up to it. Thank you again and I just signed up for updates – your words truly resonate with me. Wow and amazing… this was a perfectly timed email to receive at this time in my life. Your words are prophetic yet kind and gently. Thank you for sharing this amazing information. Mourning during growth is a new concept to me that I need to embrace and experience. Blessings of love and light. With much gratitude. I am somewhat estranged from my two children. I take responsibility for the situation, I have always been available to them, however not necessarily accessible. That changed seven years ago. I have been able to make amends to my son, there are the beginnings of a relationship. Still very awkward. Many roadblocks to my daughter, the thought I abandoned her is perpetrated. In actuality is was myself I abandoned with my family as the casualties. It has been over twelve years, I will not let go of the hope that at some point there will be a way to rectify the hurt I caused a young girl. For me, the willingness to know the difference lies in my heart. Thank you! I loved this and it was very much needed. It’s time to close that chapter as their are so many more chapters to be written. I have been holding on to something that I didn’t deserve by a mean spirited person. Today, I release it all and step into my new shoes ?? So beautifully written and so true! From personal experience mourning has definitely led to personal growth in ways I never even knew were possible. Self love has been at the core of my journey and has really expanded the possibilities of living an authentic life. The best is yet to come! Thanks Jason….. I have just in the past week sold most of what I own and moved on a one way ticket to Berlin. It is a trying time that is causing a great deal of anxiety that I am trying to accept in its own nature for what it is. I also know that it is growth. I trust that I can make this work and find the life that I desire. This is one of the most beautiful pieces I’ve read in a long time. Thank you. I guess somehow I missed several of your writings must be a computer glitch. This writing about mourning and growth and growth and mourning once again hit a most sensitive note with me as I face the realities of my daily cancer challenges. I cannot swallow my esophagus is sealed shut my mouth opening is minimal hard to brush my teeth my vocal cords are paralized so I have a trachea in my throat and I have a g Tube thru which I eat. My/our social life ( Sandra my angel wife) has been seriously adjusted my work life has disappeared my weekly life has 11 therapy sessions to maintain the status quote of challenges that chemical and radiation have caused to keep me alive. So I also had the same shoe challenges as you. I thrive and I marvel at the wisdom of and your gift of expressing these realities as expressed in your writings. You are a unique and talented gift from God and I thank Him for placing you and your family in my/our lives. I experienced this within the last year. It was so hard to let go of my dream of being a dancer (competitive!) Especially when I was so close!! I kicked and screamed and yelled at the world…..I was ready to give up. And one day, I just let it go. Not completely…..looking back on everything still hurts. But i mourned my dance career, and realized that I couldn’t live like this forever. That same year 3 people that I knew died, and I realized that life was too precious. Too precious for me to be sitting around and wallowing. I made the decision to get better, do something else with my life, and basically LIVE! Live well! Now, I have a job, I’m looking for a place with my husband, and we are planning at the end of the year to start a family.